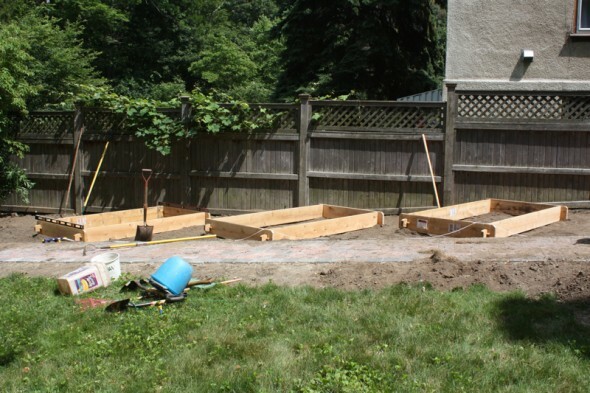 We recommend installing long-lasting cedar raised beds. This will help you grow healthier plants and vegetables without harmful, chemically-treated wood that could leach into your soil or plants. Mortise-and-tenon joints cannot be pulled apart – as may happen with beds that are nailed or screwed together. You can stack them in double or triple layers to gain height if desired. Raised beds provide even drainage throughout the growing season. You’ll conserve water without fear of runoff. Filling each bed with our special raised bed mix ensures vigorous plant growth. It doesn’t matter what kind of soil is underneath the beds. Yields will be higher since the soil is open and friable, with more oxygen available to root zones. You won’t need to walk ON these beds to work in them, only AROUND them! And soil in raised beds warms up earlier in the spring so you can get a jump on planting. Floating row covers can be quickly pinned down for season extension.